Check out the machine below...I did that! This machine was given to me by my mother in law. I love Vintage Singer Sewing Machines!By Vintage I'm talking about those heavy, all-metal construction, runs like a work-horse relics of our Grandmothers day. Sewing machines made WITHOUT plastic parts, pre-1960. I will share with you what I know in working with these vintage sewing machines. 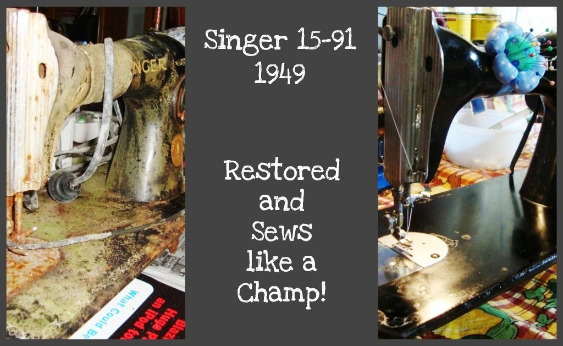 I've worked on many makes & models and I personally prefer the older Singer machines because they are the easiest to work on, and parts are readily available, even for Singer sewing machines over 100 years old! These sewing machines were meant to be repaired, NOT replaced. When I see a plastic sewing machine I cringe. Meant to break, meant to replace, simply disposable. When I think about the tons of machines I have worked on and the countless parts that have gone through my hands, I can simply tell you: less is more. I work on all of my own sewing machines. All of these machines sew perfectly. I especially love my 1889 treadle! I imagine the hands of the woman who used it before. I wonder what her story was. It simply amazes me how a sewing machine that old can sew a perfect stitch. The design of these older sewing machines is simple. Machines these days are so complicated with all their bells and whistles and with features you may never use. The first machine I ever owned was a basic Brother sewing machine from the 1990’s. The serviceman told me it was broke. I don’t know how that could be, considering I hardly ever used it. Interesting. It was then that I started to appreciate the older machines more. Do you own a vintage sewing machine that once belonged to your grandmother, or did you buy it in a local thrift shop or yard sale? Would you like to keep a part of History alive? Don’t feel intimidated, because you CAN get it up and running in no time at all! Why not create your own tool box? 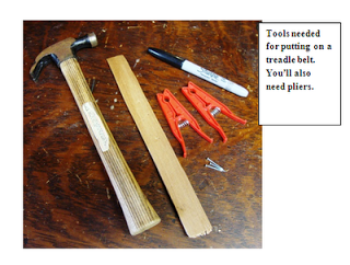 You can use a pail, basket and make a liner for it, or an old tool box. Refer to the list below to get started. Depending on how much you plan on working on your sewing machine, you may not need all of these tools. What kind of machine do you have? This is important to know. Knowing what type of machine you have will let you know it’s capabilities and limitations. If you have the original manual this will save a lot of time. If you do not have the manual, look for a serial # or any identifying marks on the machine. If you have a Singer Machine, you'll need the serial # on your machine to find out when your machine was made and what model you have. Once you know your model #, the fun starts! You can learn all about the history of your machine and it’s functions. If you don't have a Singer sewing machine Contact me and I’ll see if I can help you date your sewing machine. If you have a Singer and need a manual, enter your model # Here. If you are looking for other manuals, contact me. 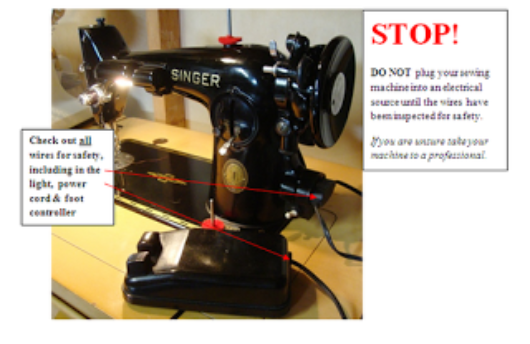 Do not plug in the sewing machine until it has been determined that all wiring is safe! Sometimes there's exposed wiring that you are unable to see, so always have an expert inspect your machine before you proceed to clean or test it. Exposed wiring against a metal sewing machine is a safety hazard! Whether your sewing machine has been sitting in storage or you just picked it up from a yard sale, you must check it to make sure it is safe to use. Protect your work surface by lying out sheets of newspaper or on a box that has been flattened. Gather your tools. Sit the machine, right side up, onto the work surface and begin your inspection. With a flashlight carefully look at the wiring of your machine. Is the wiring exposed or dry rotted? If so, DO NOT plug it in! An old machine with exposed wiring is dangerous! If you are NOT knowledgeable in replacing wires, then leave this up to a professional. Tip: I encourage you to take a few pictures of your machine while you are working on it. This will help in reminding you how to replace certain parts. Even if the wiring is in good condition, you still should NOT run a machine that has been sitting, unless it is cleaned and oiled first. Usually old machines have lots of dirt and oil/grease buildup. 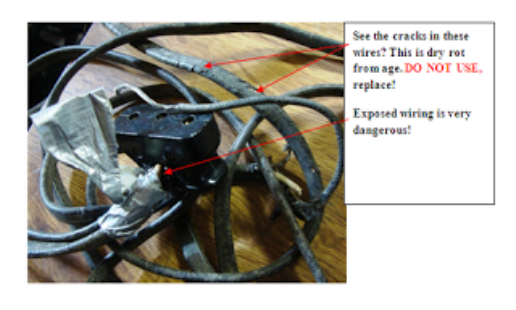 Refer to pictures below for example of dry-rotted wiring. Let’s Begin. Wear your safety glasses! I cannot stress this enough. Once day I was working on a sewing machine and not wearing my safety glasses, and as I started to sew, the needle broke and flew up and hit the lid of my eye. I was lucky that the needle didn’t go INTO my eye! In another instance while working on a sewing machine a metal slide plate spring brokeand hit my face, another close call. Needless to say I now always wear my safety glasses! Needle- Remove that needle and discard it. Whenever I work on an old machine I always discard the needle. Even a small burr or bend that you can’t see will prevent you from making stitches and cause headaches. The best remedy is to always start with a brand new needle. Size 14 is a good choice, as it is a general size needle for many sewing projects. Refer to your sewing machine manual for proper needle installation; as this differs depending on the make & model of your machine. Manual testing & overall condition- Lay the machine on it’s back and look underneath & as much on the inside as you can (you may need to remove plates to access parts of the inside). Is anything broken or bent? Are any of the rubber parts dry rotted… such as the bed cushions (little rubber feet), not all machines have these though or the bobbin winder tire? Is there rust? There may be rust you can’t see, such as in the inside of your machine. You can see if the parts move freely by manually testing the machine. For most Singer sewing machines, turn the hand wheel (aka balance wheel) towards you. (For other machines refer to the manual). Does the hand wheel turn freely? Does the needle bar move up and down? If the hand wheel turns freely this is a good sign. Lift the presser bar lifter (this lifts the presser foot)…does everything move freely? Tip: Do not remove too many parts at once. Until you become familiar with the parts of your machine, I recommended only working on one area at a time. Many parts are still available for vintage sewing machines today, the most popular being Singer machines. 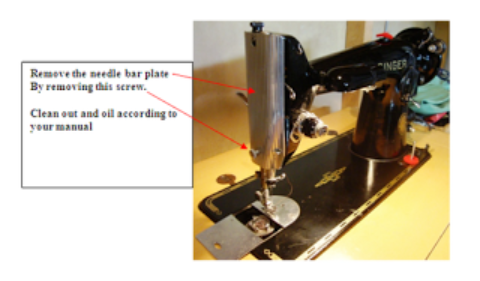 You must know the make and model of your sewing machine before you can find the appropriate part. If you have a part # for the part you need, it will make it much easier to replace that part. The best way to find the part you need is to do a general search on the internet. Ebay is a great place for finding parts too. If you need help finding a part Contact me and I’ll try and help you find it. I respond same day until 5pm EST. Any emails received after 5pm are answered the next day. You must be careful what you use on your machine to remove dirt & grime. If you have an old machine with pretty decals you must be very careful! Decals are ‘silvered’ and ruined by certain chemicals. Never scrub the decals! The best way to begin to remove the dirt is by using a slightly dampened (not too wet) rag and gently wipe down you machine. A mixture of mild soap and warm water is always the safest route to take. Bobbin Case area (under the needle and slide plates)- Most times you will find a lot of dust and lint buildup here. Always, always, remove the slide plate and needle plate. Be careful NOT to lose those screws! Next: remove the bobbin case and set aside. 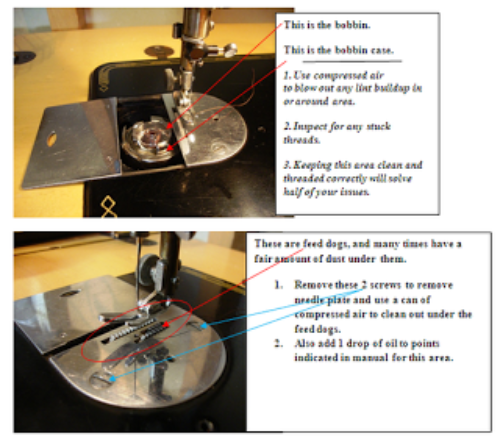 Use a small sewing machine brush and compressed air to thoroughly blow out any and all dust, etc from the under the bobbin case and feed dog area, as it is usually the most neglected area of any sewing machine. Also inspect the bobbin case thoroughly for stuck threads. You can use tweezers for removing threads. Needle Bar Plate- Another area dust likes to creep into. Remove and clean out the inner area. Stuck Threads- I’ve seen threads stuck in, and wrapped around in parts of sewing machines that you wouldn’t believe. Before oiling, and while you are clearing out any dust, check all around and UNDER the feed dogs, bobbin case, hook (which is under the bobbin case) and around the hand wheel for stuck threads that may be hiding. Stuck threads simply jam up the sewing machine. If you do find any stuck threads, tweezers and a small pair of scissors will come in handy in removing them. For rusty parts: Spray just a small amount of the kroil onto any rusty parts, for example, like screws and parts that are so badly rusted that they won’t move. Wait 5-10 minutes, if the parts won’t move, spray them again. TIP: when a screw won’t budge, I tap the screw firmly using a flat head screwdriver and a hammer. 9 times out of 10 this will ‘break’ that stubborn seal and the screw can now be removed. The other option for removing minor rust is to use a rust eraser aka Sandflex Hand block. Rust erasers work excellent. They literally erase the rust away, but they do make a mess! Do not use a rust eraser on any decals. If you are doing a restoration to remove a lot of rust, you might consider using natural Citric Acid and warm water. This method will literally eat away rust in minutes, but it will remove ALL the silver finish as well. This method is great for those who plan on re-plating various metal parts. Do not use Wd40 because it is NOT a lubricant. AFTER you have removed any dust/ dirt /debris from all moving parts, place 1-2 drops of Singer Oil to all oiling points on your sewing machine. 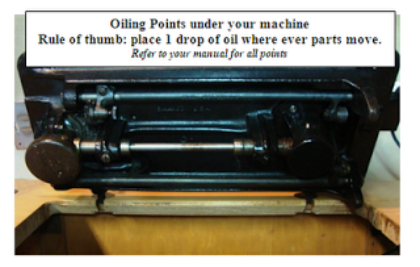 Refer to your manual for these oiling point locations. Note: Never add more oil than recommended in your owner’s manual. Body of machine (aka 'head')Take a clean rag, add some Singer oil to it and wipe down the machine. You’ll be amazed how great the machine will look after just this step alone. You may use a metal polish for shining up the chromed parts of your machine. Use according to the manufacturer’s instructions. Carnauba wax is excellent for making your machine shine. 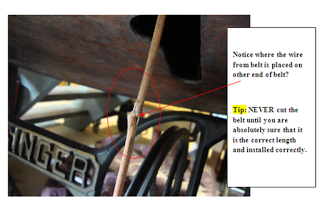 Treadle Belt (applies to treadle machines only) - Refer HERE for complete instructions. 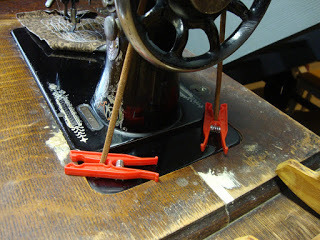 Tip: Use clothespins to hold your treadle belt in place while you install it. Now that your sewing machine is ready to use, be sure to protect it. There is little that can go wrong with your sewing machine if it is kept clean and lubricated. Do not store your sewing machine in an attic or garage where it will be exposed to temperature extremes and humidity. Store your sewing machine in a cool dry place out of direct sunlight. If you do not have a case to cover your machine, then make your own sewing machine dust cover. Proudly display your machine in the open where it can be appreciated, and most importantly, don't forget to use it! Have a question? Looking for Parts or Manuals? Contact me. I respond same day until 5pm EST. Emails received after 5pm EST will be answered the following day.